Sporadically releasing material in the most ad hoc manner, psych-folk troubadour Mark Fry recorded his Dreaming With Alice debut album back in 1972 for RCA Italy as a 19-year old student, but waited patiently for 36 years before producing the follow-up. Residing in a Normandy farmhouse, untouched and unscathed by the progress of time, Fry, a renowned painter, has recorded a further trio of albums in a comparatively short span including this latest opus, South Wind, Clear Sky. We hand you over to our lyrically assiduous and literary astute critique Ayfer Simms to set up the right ambience. 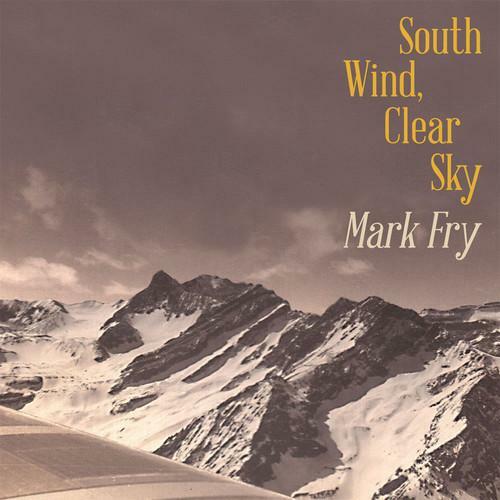 Mark Fry ‘South Wind, Clear Sky’ (Second Language) Released 29th September 2014. If you climb those stairs a little higher you may find yourself balanced on a musical leaf where a voice, gentle and soothing guides you through the air, on an autumn day, on a summer night, on a wintery frost, on a springy wavy river. The horizon is wide and open and flows like nature itself, because Mark Fry is a dreamer and his music is designed to show us the way of dreams. Back recently from a 40 years break from music, Mark Fry who had been known for hisDreaming with Alice, is a painter, a traveler, a literature lover composing and pondering from his house, recluse and open, like a messenger from the depth of his solitary moments. The dreamy world he offers is here like a cure, like another choice, a substitute to what we have to deal with every day. Under the dreamy world hides harsh realities of deception and pollution, cruelty and coquettish, frivolous hearts. To forget? To fight or to flee? There are things we can do. Mark Fry’s path is the path of the imagination used for better deeds, lessons we can learn just as the pilot learned his with the boy we call the little Prince. The tracks put you on a cloud, we gaze upon the shapes of the little houses’ beneath us, the smoky chimneys and the green squares of fields sketched out like rough drawings on a children’s book. Mark sends a dash of paint to the horizon, small tiny dots appear here and there, the world becomes another place, a place that exists for a higher wellbeing state: To turn our back on sorrow, to love paradise, to glide through the elements. Paradise is caught by Fry like little crystals from a snowy day. Why lose the perfect state of peace and harmony? Why lose the way to the perfect world? Distant world and whimsical world. Mark Fry wants to let it go, he is already there in spirits. But he shall not because we are here part of his universe. He is divided between fleeing forever and stretching a hand out for us. His earth is spinning away on its own in the distance, amid the muffled radio waves. And we remain high above the sky, “higher than the birds”, and safe in a hazy nebula, with the echoes of somewhere else. There’s a path to escape the burden of the world. Fry’s voice, gentle, marries the music’s wavy solemn movements, perfectly in tune and rich in subtle layers, the sky is wide, and the air is grand. The discreet musical horns and instruments bring us far from the sadness of this world. With the high hopes of the seventies we sought refuge behind “San Francisco” and the flowery movements, we are now beyond that idea and seek shelter within ourselves. There is no denial in this album, there is a gentle urge to change perspective: the serene message and the musical back up that reinforces the merciful vocals do that wonderfully.